Joy Toma knows short films. 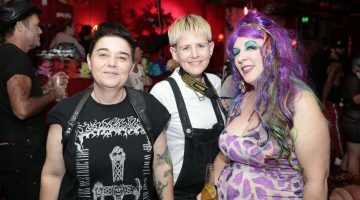 The former executive producer of SBS’s Eat Carpet has seen hundreds of them, and was expected to be a harsh critic when asked to judge this year’s My Queer Career short film competition. Entrants can breathe easy -“ Toma was pleasantly surprised. I was really delighted by the standard of the top end of the work, to be honest, Toma said. It felt like some of them were very emerging filmmakers but they’ve really got their act together, and they’re on their way now to making really interesting cinema. They’re the kind of names that I think we’re going to see in the future, who are going to end up winning awards at Sundance and around the world. There’s some really talented gay and lesbian filmmakers out there. That’s the good news, at least for the nine finalists. At the other end they’re still kind of embryonic, still toying with the form. They probably need some good advice if they want to stay making films, Toma said. And that’s me being incredibly frank, because I’m known for being very frank. Toma will be attending opening night with fellow judges Fenella Kernebone (SBS TV’s The Movie Show) and cinema manager John Bortolin, but said she’s more than happy to chat with entrants about their work. However, sensitive types should be prepared for a frank response. I think all the jury would be open to doing that, she said. I also think it’s important on the night for the people whose work didn’t make it to the final round -¦ to go in and go, okay I didn’t make it this time, this batch of films did. Why did they? Because that’s what people pay thousands of dollars to go to a film school for. Save yourself some money. Sit in the audience, listen to the audience, watch what they gasp at and what they’re laughing at. Toma now works as a freelance consultant on developing scripts and says the secret to great moviemaking is something of a clich?passion. If you haven’t got the passion, don’t bother spending the money, she said. Don’t waste taxpayers’ money because you want to kind of fulfil some ego thing. Whether you’re gay or straight, forget about it -¦ Don’t disappoint an audience. Because that is the worst feeling for an audience to walk out and feel ripped off. What you don’t need, according to Toma, is a lot of money, and this year’s finalists are a testament to frugality. One film -“ Coming Out At Work Is Hard To Do -“ they spent $200 on the entire film and all of that was spent on glitter! Toma said. Another one called Bright Lights cost $170. People are really doing it cheap, but smart -“ not a bad combination. The Mardi Gras Film Festival opens at 8pm at Thursday 17 February with the My Queer Career Awards and screenings. To book for the State Theatre event phone Ticketek on 9266 4800.